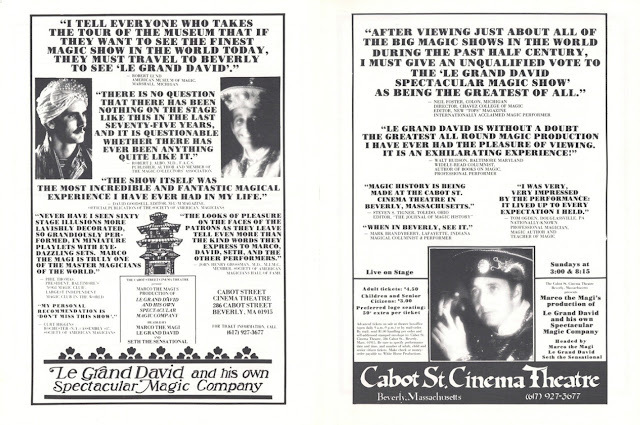 "The First Time I met Le Grand David..." These are the first words from a lengthy monologue delivered by Webster Bull during the Le Grand David Show at the Cabot St. Cinema Theatre. For some reason those words have been stuck in my head now for several days. I hear them over and over and my mind goes back to the first time I met Le Grand David. It was many years ago now. In fact, it was in the early days of their show, in the early 1980s. I was just a kid. 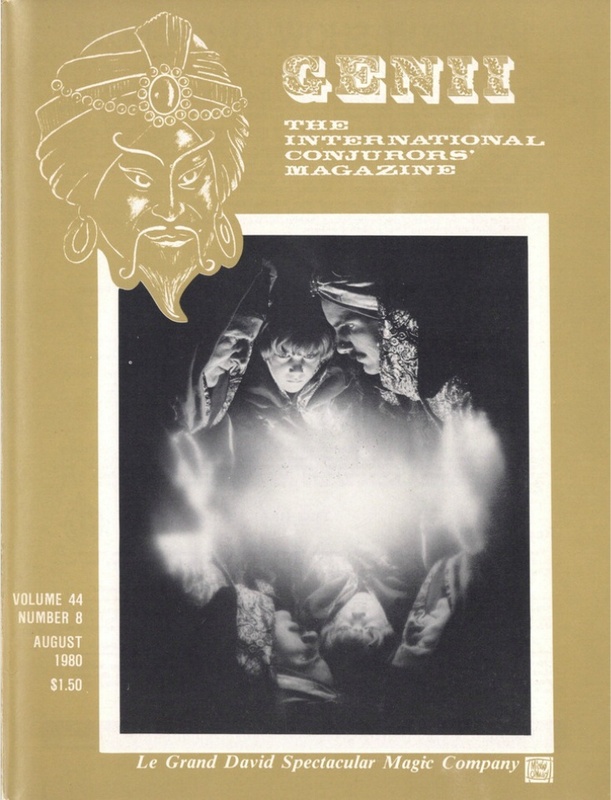 I had found out about the show through Genii Magazine. The ad above is the one that caught my eye. As it turned out my family was going to take a trip to New England to visit some friends and I mentioned to my Dad this magic show thing. He suggested we ALL attend, so 9 of us showed up at the box office in Beverly. Back then, there wasn't a whole lot to the town. It had seen better days. The theatre seemed to be the only life in the area. No one knew what to expect, even me to be honest. Walking in the theatre doors, it was if the show had already begun. There were costumed characters in the lobby greeting people. Further down there was a puppet stage set up. There was a feeling of excitement even before the show began. I just soaked it all in. When the show began, I was overwhelmed with the spectacle. There were elaborate costumes, beautifully painted props, and what seemed like tons of people on stage. Also, there were curtains and gorgeous backdrops. This was not like any magic show I had ever seen, though I had not really seen that many magic shows live. I had not even seen Doug Henning perform LIVE yet, that would still be a year or so away. If you read the title at the lower left hand side of the ad above it reads "Le Grand David and his own Spectacular Magic Company". I assumed, the show was this guy Le Grand David. I had missed the part on the right hand side page that reads "Marco The Magi's production of..." So when I began watching the show, I immediately recognized Le Grand David, but the person who stood out was Marco the Magi. I remember the drive back to the house after the show, most of the talk was about this guy Marco. Why? His character was a wild man on stage. He was funny and extremely energetic. I remember his very theatrical Linking Ring routine. I remember that he performed what would become one of his signature pieces, The Floating Table by making the table float, and then he walked into the audience with the table floating against his fingers. And I believe Seth, the youngest member of the cast, also did the table floating along with him. I don't remember every bit of the show, but I remember a lot. I recall being blow away by David's skill with the billiard balls. This was a trick that I was just learning at the time and I was dumbfounded at how well he handled the mystery. I think more than anything it was the smaller stuff that really fooled me. The stage illusions were great, but I was fairly knowledgeable about the inner workings of those things. I say that, but in truth, I really didn't know as much as I thought. Naturally, today, having performed many of those same illusions, I do know how they work, but back then, I'm not so sure how many I truly knew. I can tell you this, when the show was over my head was buzzing. OH, but wait, I forgot to mention the intermission. So this show had an intermission, and everyone got up to get a refreshment or stretch their legs or use the rest room. Well, I got up and was standing in the back of the theatre by myself. I happened to look over and I see someone that I recognized, but had never met, Irene Larsen. I instantly wondered if Bill Larsen was there, they were married after-all, and sure enough he was. So I got to meet Bill and Irene for the first time! 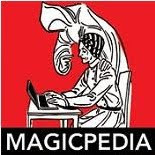 I had been writing letters to Bill for a while because he was editor of Genii and frankly, I didn't know many magicians, so I often would contact people via snail mail. I EVEN had a copy of Genii with me, and you know what, it didn't even occur to me to have them sign it! I had David Bull sign it, but I didn't even think to have the editor of the magazine sign it! Oh the brain of a child, lol. the cover but Le Grand David! 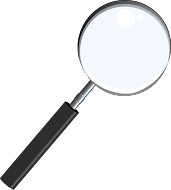 It took Bill two issues to fully cover his experience at the show. 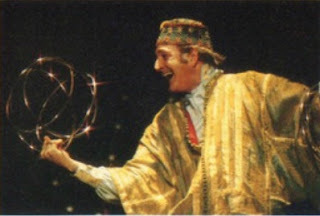 In fact, he wrote "Seeing Marco the Magi's production of Le Grand David and his own Spectacular Magic Company was the most exciting magical evening I have had since I first saw the Dante Show." I never forgot that first visit to Beverly. Years later, I would send a letter to Cesareo telling him about my first visit there and he replied by inviting me and a guest up for the weekend to enjoy the show all over again. Enjoy it I did. In truth, the second visit to Le Grand David changed my life. I have never been the same since. It was an extremely positive experience and becoming friends with the company has been a bonus. I'm certainly not a close to them as some folks in the magic world, but I have always felt a bond, thanks to Cesareo and David and Rick Heath and Avrom and Ann and other members of the Le Grand David Family. Oh, incidentally, that magic show also changed the life of that town. When I returned to Beverly years later, the downtown area was a thriving place with shops and stores and many restaurants. The show and theatre breathed life back into that area, and that magic show is what breathed life into many of us fellow magi. On April 10th, Kaminski Auctions in Beverly is holding the second Le Grand David auction. If you're a fan of the show you have a chance to pick up something to remember the show by. There is not as much in this second auction, but there are certainly some very nice pieces.